After 20 days at sea, just eight minutes separates the top three boats at the ocean race finish line in Auckland. 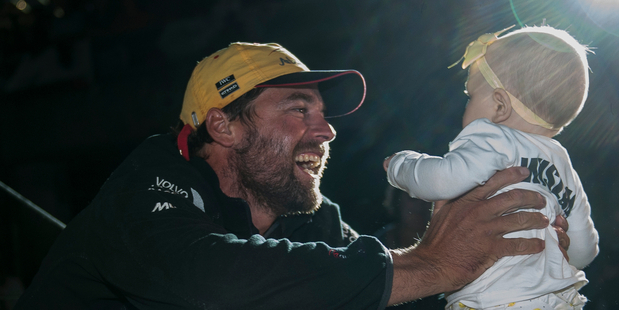 Auckland – the home of some spectacular finishes in the Volvo Ocean Race – again delivered a memorable welcome for the fleet at the weekend, but for two Kiwis at the helm it was special. With the fleet of six Volvo Ocean 65s safely in port, the shore teams were yesterday hard at work hauling them out for repair and maintenance. The boats are expected to be out of the water for a week, returning by next Monday. After 20 days at sea, just eight minutes separated the top three boats at the finish line in Auckland on Saturday night as Spanish team Mapfre triumphed in one of the tightest finishes in the history of the round the world yacht race. Abu Dhabi Ocean Racing, with New Zealand’s Daryl Wislang at the helm, finished second to claim the overall lead from Dongfeng Race Team, who were four minutes behind in third. Abu Dhabi skipper Ian Walker joked he let Wislang take the wheel as it was best left up to a local to navigate the large flotilla of spectator craft out on the Waitemata Harbour. “Daryl steered us in because it was all getting a bit dangerous for me. I was happy to hand it over to someone from New Zealand just in case I hit something,” said Walker. Wislang, who has competed in three previous Volvo campaigns, rated the finish into Auckland as one of the highlights of his ocean-racing career. “It was a pretty special feeling driving the boat across the finish line. You don’t get to do it very often. With all the spectator boats and channel markers and things like that, it’s pretty high tariff if you muck it up with the boats being so close,” said Wislang, who was greeted at the dock by wife Jess and their 7-month-old daughter, Pearl. The spectator fleet had plenty of advice for the sailors as well, according to Ryan Houston, one of two Kiwi sailors on board Team Alvimedica. Houston took the wheel of the fourth-placed American entry over the final few miles of the race after some “on-going banter” with his New Zealand crewmate Dave Swete as to who would be given the helming honours for the finish. Houston won out after a group of committed family and supporters went all the way out to Tiritiri Matangi, about 30km north of Auckland, to greet the team. “Dave and I have done a lot of sailing together – they call us the married couple on board. We have a lot of Kiwi chat going on,” said Houston. “It was actually quite funny because the wind had died out when we finished, so people started heckling me, basically. While the boats are undergoing maintenance, the sailors will have the next few days off to recover from the gruelling 5264-mile leg before beginning preparations for leg five to Itajai in Brazil. • March 15 Start of leg 5 to Itajai (Brazil).